ARR volunteers help put on races for a variety of reasons. For some, it offers the chance to connect with the community. For others it provides an opportunity to contribute, and to make a difference for fellow runners. Regardless of the motivation, all are united in finding it both challenging and rewarding. All ARR volunteers receive ARR Bucks that can be used as credit toward race entries and merchandise. Volunteers that put in long hours at a race receive a coupon good for one free race entry during the year. Every January we meet for dinner to honor our race volunteers, along with the ARR Grand Prix winners. Q: Why should you volunteer? A: Volunteers live longer and are healthier. Studies find that volunteers are happier and healthier than non-volunteers. In fact, during later life, volunteering is even more beneficial for one’s health than exercising and eating well. Older people who volunteer remain physically functional longer, have more robust psychological well-being, and live longer. Working alongside people who support a particular cause creates a path to developing relationships with others. And volunteering alongside family members strengthens those bonds. Kids who volunteer with their parents are likely to become adults who volunteer. Volunteering is good for your career. The relationships people create while volunteering can sometimes improve job satisfaction when they provide access to new information and opportunities. Volunteering has long been viewed as a way to create new connections that lead to career opportunities. If your values include running and fitness, consider becoming a volunteer for Arizona’s premier running organization. 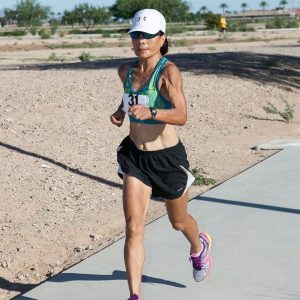 "I enjoy helping others along their running journey no matter what level they are at. I volunteer for selfish reasons as well, being around all the smiling people brings me great joy."